Pictured (L-R): Lesly Simon, VP, Promotion, Arista Nashville; Jim Catino, VP, A&R, Sony Music Nashville; Ann Edelblute, Carrie Underwood’s manager (The HQ); Ken Robold, Executive VP/Chief Operating Officer; Carrie Underwood; Randy Goodman, Chairman & CEO, Sony Music Nashville; Paul Barnabee, Senior VP, Marketing, Sony Music Nashville; and, Steve Hodges, Executive VP, Promotion & Artist Development. One of the Grand Ole Opry’s greatest voices previewed new music this week, and Music Row’s party people were there to celebrate. Superstar Carrie Underwood was in the spotlight on Wednesday (Oct. 14). Sony hosted a wonderfully imaginative party to introduce her album at The Standard downtown. The restaurant is located in the city center’s last standing Victorian mansion. The building’s historic rooms were decorated to reflect the CD’s songs. Storyteller is the collection’s title, and its marketing slogan is, “Her Voice Carries the Story.” “Carries,” get it? The first “theme” room was for the song “Dirty Laundry.” It was decorated with clotheslines. The bar there was serving, of course, dirty martinis. The song’s co-writer, Ashley Gorley, was there to greet you. So were Steve Buchanan, Kay West, Nancy Shapiro, Pete Fisher, Scott McDaniel and Jody Williams. The second room was “Church Bells.” Rose petals covered the floor, and a wedding gown was on display. The bar served, naturally, champagne. Co-writer Zach Crowell hovered. So did Jon Freeman and Shannon McCombs. Next, we wandered into “Heartbeat.” This room was decorated with heart symbols. Ben Carver and Sara Haze were in there, even though they co-wrote “Relapse,” a different song on the record. 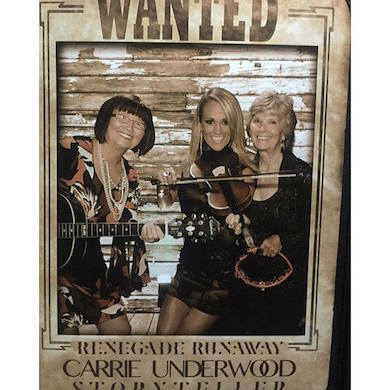 The “Renegade Runaway” room was an Old West barroom serving whiskey. It had a photo booth where you could pose for a souvenir snapshot as a “Wanted” mini-poster. Co-writer Hillary Lindsey was lingering nearby. I complimented her and Liz Rose for their outstanding performance at the Nashville Songwriters Hall of Fame ceremony. Onward we went, into the “Smoke Break” room. This one had closed French doors, since it was a cigar lounge with brandy varieties for libations. Also, a big video screen showed Carrie’s rocking video of the song. Co-writer Chris DeStefano was puffing away. At the rear of the building was the “Grand Ballroom.” Screens in this elegant space showed slides of the remaining eight songs on the CD, with writer credits. This was the schmooze headquarters. Fabulons in the cast of thousands – okay, hundreds – included Brett James, Leslie Fram, Lisa Konicki, Chuck Dauphin, Allen Brown, Pat Higdon, Carla Wallace, Bill Catino, Kos Weaver, Chris Oglesby, Paul Barnabee, Cindy Watts and the enduringly endearing Mark Bright. Host Randy Goodman informed us that the laminates around our necks had “iDitty” download codes that contain the whole Storyteller album. The only thing is, “You have to wear this constantly between now and Oct. 23,” for this to work, Randy joked. “You know all the stats,” he said. “She’s such a phenomenal artist. “Thank you guys so much for coming out this evening,” Carrie said to the throng. She looked amazingly slim in her fetching, lace-embellished black cocktail dress. “They did such a great job of putting this party together.” Amen to that. The Standard’s hors d’oeuvres included salmon and roasted capers with cream cheese, pimento cheese, bacon plus tomato bits and other delicacies on toast points. The wait staff seemed way under-manned for the size of the crowd. Guest Deborah Evans Price came bearing news. Her book, Country Faith Christmas, comes out on Monday. “It’s not War and Peace,” she blushed. No, but it is a big-time brand. Cracker Barrel is stocking it, plus its companion CD, as well as, get this, a jewelry line. She was wearing its charm bracelet. The book contains stars’ holiday kiddie photos, memories and recipes. Storyteller releases Oct. 23. Parties Are Us. Onward to the next. The dandy party was put on by Legacy-PR and Events.